The table below gives the times of sunrise and sunset, the start of morning and the end of evening civil, nautical and astronomical twilights, the start and end of the Hours of Darkness† and moonrise and moonset times for 2019 March 20 for a selection of places in the British Isles. Information on the phase, age and illuminated fraction of the Moon at 0 hours on the above date can also be found at the foot of the table. 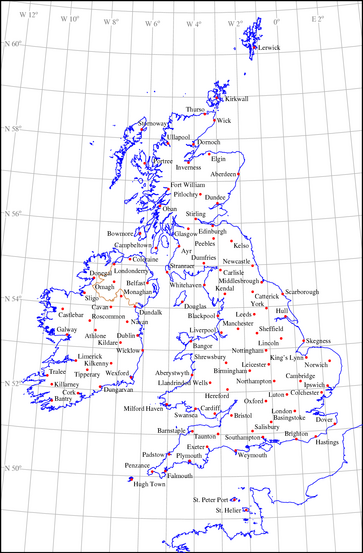 The map on the left shows the distribution of locations for which data have been generated in England, Scotland, Wales, Northern Ireland, Ireland, the Channel Islands, the Isle of Man and the Isles of Scilly. A larger pdf version of this map can be viewed by using the map as a link. If you are at a location other than one of those listed below, please choose the nearest town or city in the table to your location. By adopting the data for this location, the timings of rise/set, twilights or Hours of Darkness should be within 2 or 3 minutes of the correct value for your location. † — The Road Vehicle Lighting Regulations 1989 introduced the term "Hours of Darkness" in place of "lighting-up period". During the Hours of Darkness vehicle headlights must be used. During the half hour intervals from sunset to the beginning of the Hours of Darkness and from the end of the Hours of Darkness to sunrise at least sidelights must be used. This symbol shows the phase of the Moon for 2019 March 20 at 0 hours GMT. The age of the Moon is 13.3 days old and the illuminated fraction is 98 per cent.